During the AM peak period, service has improved between Lawrence West Station and Yonge (because the Pearson Airport service was extended to Yonge), and on the Dixon Road branch of the route. Other portions of the route have less service in 2018. During the Midday period, there are more buses/hour in 2018 on all sections of the route except The Westway from Royal York to Martin Grove. AM peak service has improved most notably between Wilson Station and Yonge Street, and only slightly on the rest of the route. Midday service is less frequent over the entire route, a change that is partly offset by the express service to Humber College for those who can use it. Local service during the AM peak and Midday has improved, and this is supplemented by the express operation on the eastern part of the route from Yonge to Sheppard West Station (formerly Downsview). During the AM peak, service improved slightly on the outer end of the route, notably west of Kipling, from 2009 to 2017, but on the eastern end of the route there was no change. Midday service saw increases over the entire route. When the TYSSE opened, service between Finch West and Finch Stations was cut by about 50%, but increased slightly on the rest of the route. Some of this cut will be restored in the fall of 2018 because demand was higher than the TTC anticipated. 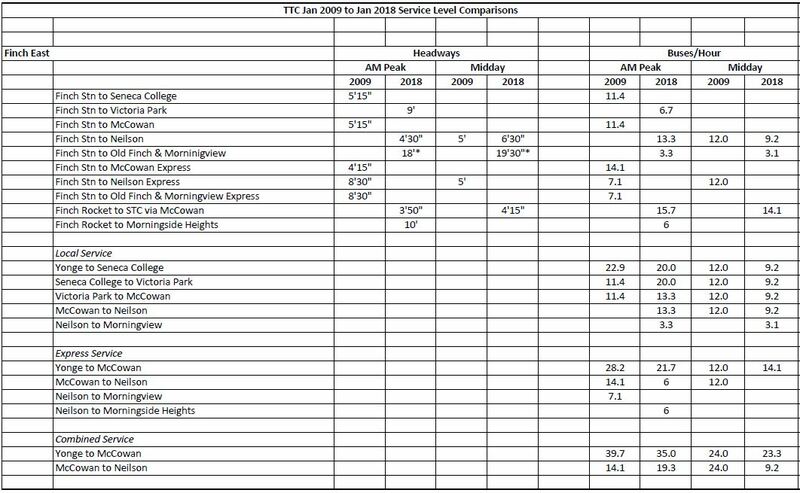 On Steeles West, there is less local service capacity over the entire route during both the AM peak and Midday comparing 2009 to 2017/18, but this is offset by peak period express service that did not exist in 2009. Service capacity over the entire route is lower in 2018 than in 2009 during the AM peak and Midday periods. Service capacity over the route has not changed much from 2009 to 2018 with some AM peak period adjustments between express and local service, and a slight decline in Midday service. Service capacity has generally declined over the route for both the AM peak and Midday periods. This is a complex corridor with many overlapping services. During the AM peak there is some decline in service west of McCowan, and an improvement east of there. Midday service has declined slightly west of McCowan and steeply east of there. Service has improved in the AM peak primarily with the extension of the Pharmacy short turn to Markham Road. Service on all branches in the AM peak and Midday is less frequent in 2018 than it was in 2009. Service in the AM peak is unchanged from 2009 to 2018, but has been reduced during the Midday period. Service has improved slightly from 2009 to 2018, although there has also been a rebalancing of buses so that there are more express and fewer local trips. Service has improved during the AM peak and Midday with a rebalancing of local and express services comparing 2009 to 2018. Service capacity has declined from 2009 to 2018 in the AM peak, and only slightly improved during the Midday. Service capacity is slightly reduced from 2009 to 2018. Service capacity in the AM peak is slightly lower in 2018 compared to 2009, while in the Midday service has improved. Service capacity in the AM peak has improved slightly from 2009 to 2018 with a shift of some trips from local to express service. Off peak service is unchanged. Service capacity in both the AM peak and Midday is reduced in 2018 compared to 2009. Service capacity in the AM peak is unchanged from 2009 to 2018. In the Midday, the service to Steeles has been improved, but the Progress branch to STC is unchanged. The 86 Scarborough and 116 Morningside buses share mileage on Kingston Road, and so for the purpose of this comparison I show them together. There are ups and downs in service capacity depending on which part of the routes one looks at. The major change lies in the express service to UTSC which has been improved. This entry was posted in Buses, Service Analysis, Service Cost and Quality. Bookmark the permalink. ← Why Can’t I Get On My Bus? Another thing that should be pointed out is that there seems to be an overall trend to simplifying routes. This is especially apparent over the past 3 or 4 years. Quite a few routes that used to run with 2 or 3 branches – with a much better combined headway over the busiest part of the route – have been simplified to have only 1 branch, and usually with no increase in vehicles. This means that while the outer ends of the route may have better service, the busiest portion is left dealing with worse service. The City of Toronto grew by just over 200,000 people during 2009-2018, or 8%. Contrasted with the service expansion (or contraction) detailed here, the reasons for what we’re seeing with buses is obvious. The design for Agincourt GO station came out. Look at the poor connection to the 85 and 190 bus. There are no protected access to reach the eastbound platforms bus stops. It is great for connecting west bound. GO Transit is starting to take riders away in Toronto. When midday service came on the KItchener and Stouffville lines, it was literally ghost towns in those trains. Now, the 6 car trainsets are getting decent ridership. No one wants to use 70 minutes of their time getting downtown, when GO Transit will take less than 30 minutes. If people want to ride GO trains and the TTC do not connect to those stations, it is obvious that fewer people ride buses despite population growth. In the aviation world, a plane sitting on the tarmac is not making money. Airline CEOs want their planes to be in the sky all the time. When the TTC is parking buses on midday and weekends, those buses are depreciating even though they are not serving Torontonians. Steve: Some of the station designs for the new GO/SmartTrack stations are appalling in terms of access. A correction, the 52F and 52G midday headways are definitely not 6’30” each. That would be the combined headway of the two branches which are 13’00” each. Overall service did improve between Royal York and Lawrence Station but not the entire route. The section where the 52A/B branch off at Scarlett Rd and Royal York is called Lawrence not The Westway which begins west of Royal York Rd. Steve: Thanks for catching this. I was rearranging this portion of the table during the original edit, and got the headways on the Westway branch wrong in the shuffle. Also, yes, the name does not change until west of Royal York. The table has been updated. Steve, not sure why in your description of the service on Steeles West you say that express service didn’t exist in 2009. Express service most definitely existed in 2009 with 60F to York and 60E to Kipling rush hour only services. Steve: The peak services on 60 Steeles West in 2009 were ONLY the two “express” branches, and they only ran express from Finch Station to Steeles, but local on Steeles itself. This is by contrast to the 60E today which is a truly limited stop operation over the entire route. They switched over to limited stop service in October 2009. Steve: Yes, but my table is as of January 2009. Thank you, as always, for your analysis. It seems no one cares what is happening on the buses. Lately service on the 41 during pm rush hour has been terrible. Gaps of 20-30 minutes, clusters of buses running together. The TTC offers the same answers of route supervisors are making adjustments etc traffic etc. It all rings hollow when the same problems happen every day. Service has declined fast in the past few months. Related, I’ve noticed lately that the TTC is running 512 streetcars out of Gunn’s Loop “out of service”, passing waiting passengers, only to put them into service a few stops later. What is this about? Is this new? The vehicles appear in NextBus as in service. Why punish waiting passengers when you can run a proper headway? Steve: It is possible that the TTC is attempting to restore regularly spaced service by “dead heading” cars some distance from the terminal to space them out. However, given the general lack of attention to headway management by the TTC (they only measure it at the terminals), I suspect this could simply be operators making up for taking longer layovers than are justified. Any ops with further info on this are welcome to comment. Regarding Tara’s account of 512 St. Clair: Steve is correct as to the streetcars “expressing” to a point on the line in order to balance headways. It is essentially a short turn (without it being recorded as such) however would have a return to service point shorter than the short turn location. This method is more predominant with bus operation however is being more used in streetcars (the subway also does this). Steve: I first saw this technique decades ago in Boston from which the new CEO Rick Leary hails. He would be well-acquainted with it. Since streetcars often pick up random citizens on Bathurst north of Bloor while deadheading to St Clair in the AM; it seems inconsistent, to say it nicely, for some of the same operators to deadhead past actual St Clair clients, on the job. What gives? Steve: This is a classic left hand, right hand problem at the TTC. There is no reason for streetcars to dead head on carhouse trips, but some do. Buses do this regularly in order to run express and shave time on schedules.